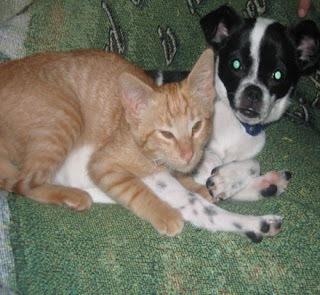 This is Pretty Girl the cat and Oscar the dog. Oscar is a Pekingese and Chihuahua mix. He was the only boy and the only one who looked like a Chihuahua. Oscar is also a garbage disposal. He will eat anything that hits the floor. Pretty Girl was a stray. You might remember me blogging about it back in August. Her and Oscar are the same age. We usually find them like this. Cuddled up together, giving each other kisses. Everytime I see them like this, the song "Secret Lovers" starts playing in my mind. This would be Gizmo. 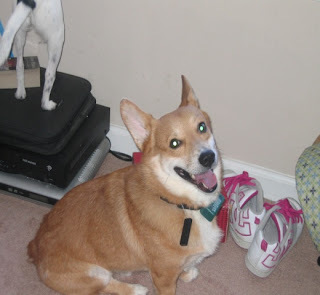 Gizmo is a Pembroke Welsh Corgi. And yes, he is always smiling like that. We got Gizmo about 4 years ago. He is a calm dog, except when company comes over and he turns into a nut. He runs, barks at you, brings you every toy he has. Once you toss his ball a couple of times, he calms down. He also likes to play with balloons. He likes to bounce them in the air. Here is a little video that Mary, the youngest, took of Gizmo playing with the balloon. Please ignore my messy house. It was the Saturday that snowed and spit ice all day and I didn't feel like doing anything housework related.